Abstract: This article looks at the Wisdom Development Process and the importance of the heart in ensuring sustainability. This will be a key process for developing leaders in the emerging Wisdom Economy. In my own personal journey, I’ve frequently looked at what sustains me and my friends and colleagues while meandering on the various paths we take. Coming from a family structure that prized the mind, this journey has taken me ever inward. About 45 years ago, the journey changed focus toward the heart. More specifically, I’ve looked at my experiences with wisdom and loving. My question, or more accurately quest, “What is it that seems to have a never ending regenerative power?” I’ve looked closely at the mind and what can be accomplished through using it. Clearly the intellect offers brilliant insights into the functioning of the world, but seems to get tired when used continuously. Intuition seems to come and go and thus can be fleeting. For me, the heart or more specifically loving grows stronger and more vibrant through frequent use. I know that my health improves the more my attention is focused on loving. The world seems to take on a brighter hue when I’m moving from my heart center. Perhaps you too have had loving experiences that have transformed your health and perspectives. Much of my professional life as an academic, consultant, trainer and leadership coach has afforded me the opportunity to study various approaches to leadership. A great deal of the current leadership education offered globally focuses on analysis and understanding what works and why. 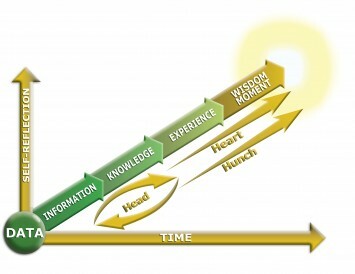 Another aspect of my research was the heart’s impact on developing wisdom. Leadership also seems to reflect the economic age we are in. From my perspective we are moving from the information and knowledge ages into the emerging age of wisdom. This age will lead us to a wisdom-based economy. While the term “Wisdom Economy” was first presented by Earl Cook in the early 1980’s, the transformation of leaders that heralds the coming of this economy is just now starting to take place at an ever-increasing rate. Information has become a commodity. Any person with an Internet connection has access to almost all of the information in the world, regardless of where they are in the world. This amount of information far exceeds the legendary libraries of Alexandria in ancient history and rivals such contemporary collections of data as the US Library of Congress. Amazon.com has over 120,000 books available, just on leadership. Both hardware and software have been developed to house and analyze the accumulated information of mankind. This information has been deciphered through pattern recognition, which has given us deeper and deeper knowledge. The wisdom economy will be more focused on bringing forward the unique gifts of each person. Some are predicting a golden age utopia for the wisdom economy. That identical prediction has taken place with the transformation between each of the ages, from hunter-gatherer through the industrial revolution into the knowledge economy. Had these predictions been correct, we would not have any conflicts and the planet would be an ecological paradise. I think we can all safely agree that hasn’t happened. we gain the world but lose our humanity. It understands that a person isn’t defined by her or his possessions. Wisdom defines prosperity as a state of sufficiency. Without the experience and Insight that comes from the essence of a person, only accumulation is valued. The knowledge economy demands qualifications. The wisdom economy insists on qualities. Our world today is awash with qualifications. The most frequent job interview question is, “What are your qualifications.” While qualifications are important, they don’t make you a more productive worker, or even a better thinker. The Wisdom Economy will recruit for attributes as well as aptitude. The knowledge economy is technological. The wisdom economy is both technological and human. The knowledge economy is quick to see the next technological wonder leading to an increased personal fortune, regardless of the unintended consequences. The wisdom economy uses technology as a tool and is more interested in how it is deployed, understanding the need for humanity, or the highest good of all concerned. The knowledge economy is competitive. The wisdom economy is collaborative. The knowledge economy assumes that if we can know a bit more than others, we will get what they have or keep them from getting what we have. It believes in zero-sum games. The Wisdom economy recognizes that abundance is not only possible, it has in fact appeared in every previous economy. Where the knowledge economy is “me” focused – your disadvantage is of no concern as long as I am succeeding – the wisdom economy looks to “we.” It accepts at a profound level that your disadvantage is also my problem. Wisdom recognizes that when we all grow together, abundance appears. The knowledge economy is innovative. The wisdom economy is reflective. Self-reflection doesn’t displace innovation. However, it does ask toward what end is the innovation moving? It stops to consider all consequences. Sometimes this will mean a higher value is placed on pushing the “pause” button until all of the consequences are evaluated. Knowledge workers seek to control their external environment, while wisdom workers seek to gain meaning of their environment through self-reflection and the dialogue with others. Our age of ignorance is slowly diminishing. Humanity is now realizing that every action has a reaction and all costs associated with production, distribution and consumption need be taken into consideration. No longer can we ship our problems to another country. It has become too expensive, not only in terms of dollars, but at the cost to our collective humanity. The unintended consequences are asymmetrical. For example, it may take a few years to cut down forests to plant food to feed the masses, but it might take decades to grow back that which provides oxygen for all living creatures. are essentially about fragmented production, consumption and waste, towards non-linear and circular processes that have pervasive energy, efficiency and holistic sustainability as well as recyclability at the core of their design. Expect non-linear asymmetric solutions – highly imaginative, inventive and innovative. The Wisdom-based Economy is fueled more by active listening than talking. It is more inclusive in its search for solutions because sustainability, insight, context and common sense are the key words in the Wisdom-based Economy, not grabbing eyeballs, Internet speed, and elevator pitches. Integration of Head, Heart and Hunch is critical. This is also the genesis of loving leadership, where the heart takes center stage. The process for developing wisdom requires us to integrate the heart into our experience. If we only use our mind, we can only go so far. 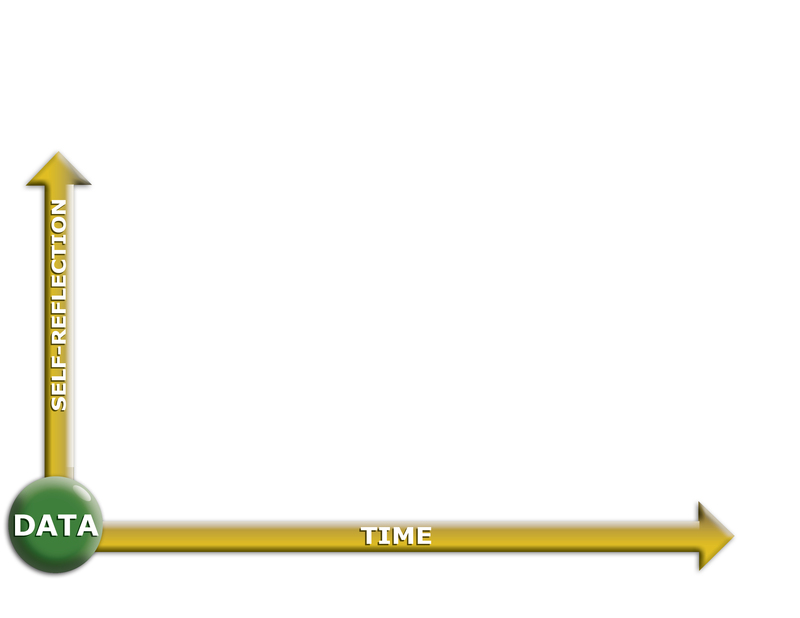 Self-reflection over time is a critical tool for developing wisdom. Our starting point often revolves around data. Some of this data is perceived to be external to us and some internal to us (unless we are living in a state of denial and then all data is perceived to be external to us). In our quest for wisdom we evolve through several stages. When we take the data we have and start to sort it, we begin to see the various relationships between the individual pieces. Sorted data begins to resemble what we call information. Today, large companies are using their massive computer power to sort accumulated consumer data to recognize relationships. In a case of unintended consequences, Target noticed that when a woman was pregnant she would buy certain products together. Hoping to leverage this newfound information, direct marketing was sent to women who had purchased these items along with advertisements for other baby related products. One irate parent demanded to know why his 16-year old daughter was receiving such a mailing, not knowing that she was indeed pregnant. The information was available but the wisdom of what to do with that information was missing. When multiple patterns start to appear we would suggest that knowledge is also appearing. That doesn’t mean that understanding or insight has begun to appear. For that to happen it takes experience, more specifically experience that has been reflected on. The deeper the reflection, the greater insight into the experience. With enough time spent on self-reflection – regardless of the data, information and knowledge – it’s possible to have a wisdom moment. Does this wisdom moment make us a wise leader? Probably not. To become a wise leader requires multiple wisdom moments that become the new data. This is a process that folds back on itself and takes time for self-reflection. Many leaders get stuck in a mental loop around data, information and knowledge. When they reach the limits of what they know, they often decide that they need more data or perhaps better data. They then go through the process distilling the new data into information and knowledge. Most of this effort takes place in their head and has relatively little experience added to the equation. To break through the mental do-loop requires getting out of our head and putting both our heart and hunch into it. This can be challenging as incorporating the heart and hunch, requires courage. Leadership courage has been written about for eons. Both loving and courage have a similar root: heart. Heart isn’t often found in today’s leadership education because that mostly focuses on the mind. However, I contend that leadership wisdom requires our mind, our heart and our hunches. It takes courage to engage our heart and to confront fear (our own or others’), pain, danger, uncertainty or perhaps intimidation (another fear-based behavior). The heart knows when the mind doesn’t. Self-reflection requires listening to the heart long enough that the mind quiets. My experience is that opening the heart and actively using the wisdom of the heart in making important decisions allows greater access into wisdom. It has required that I use my heart more often and in everyday decisions. As I stated above using the heart, actively listening to the guidance of the heart is regenerative and thus sustainable. Great article, Greg! It reminds me of the power of combining head, heart and hunch, as all truly great leaders have done and continue to do.